Motorcycle GP is one of the most popular motorsports when it comes to audience. The thrill of the race, the loud roar of the engines and the battle between the groups is what draws the crowds in droves. This is a million dollar industry. The vehicles alone are top of the range and the sponsorships provided are phenomenal. 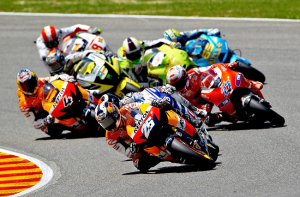 Motorcycle Grand Prix is a premier class event held on road circuits. The Fédération Internationale de Motocyclisme or FIM is an organisation which, in 1949 presented the opportunity for rules and regulations to be coordinated in such a way that certain events could be counted towards an official world championships competition. The FIM World Championships Road Racing Grand Prix is the oldest of its kind and popularity soars each year. It isn’t simply motorcycles taking part in a race. There are different races for different classes of cycles. The classes are usually indicated by the engine capacity used to power the motorcycles. MotoGP, Moto2 and Moto3 all make use of motorcycles with a 4-stroke engine. The cycles are custom built for this specific activity and cannot be ridden on public roads, legally anyway. Some of the world’s biggest brand names take part in Motorcycle GP. They equip the bikes with all the bells and whistles required to get their rider to the finish line in record time and in as safe a way as possible. Ducati, Yamaha, Suzuki, KTM and Honda all feature and dominate. The current year MotoGP is comprised of 19 Grand Prix races scheduled all over the world. 12 are planned for Europe, 4 for Asia, 2 for the Americas and 1 is scheduled to take place in Oceania. While Motorcycle may not be everybody’s cup of tea, once the engines start it is hard to ignore the magnetism of the event.